More discrimination against conservatives: Microsoft extension advises advertisers to not advertise on pro-Trump media sites like Powdered Wig. Share this! I have been contacted by Newsguard several times over the past year, always wanting information regarding Powdered Wig’s operation. I explained that our operation is pretty simple. We search for the most interesting topics, typically in the arena of American politics, and share our editorial opinions on the subject. We are much more a commentary site than breaking news. That’s about it. Oh, yeah, and we are solidly behind the President of the United States and have been since the now-famous escalator ride and announcement of his candidacy and platform. That’s when the warning bells went off. I knew nothing about Newsguard but figured it was another leftist fact-checking pile of BS employed by Silicon Valley liberals and financiers like George Soros to further punish and restrict the pro-Trump sites in the right-wing blogosphere. And, I was right. 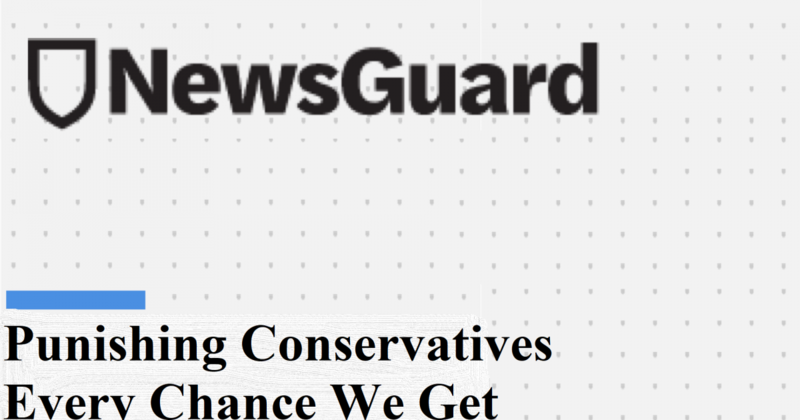 You can now add Newsguard to the list of dishonest, partisan fact-checkers like Snopes and Southern Poverty Law Center, both on the liberal payroll, charged with silencing conservatives lest President Trump be reelected. Powdered Wig is a member of a network of about 100 conservative publishers. ALL of us have been damaged greatly by Silicon Valley. Many have gone bankrupt. I continue because I have children and grandchildren whose futures I will do whatever I can to protect and vow to hang on as long as possible. Before the election of Donald Trump as President of the United States, Powdered Wig was generating five figures a month in advertising revenue, which was great, we were growing and investing in the site, but the really exciting news was the trajectory was due north. Then, we in the right-wing blogosphere, promoting and supporting candidate Trump, shocked the world. Donald Trump had been elected President of the United States, despite opposition from the Democrat Party, the mainstream media, Hollywood, academia, and even a fair contingent of high-profile Republicans. We at Powdered Wig weren’t shocked, of course. We knew what was happening. Link…. Our early morning Election Day report. For the first time, relying on patriots from sea to shining sea who were getting their news primarily from the right-wing blogosphere instead of the mainstream media, a president was elected in large part due to the unvarnished, raw, honest reporting of right-wing sites like Powdered Wig, and politics became a whole new game. Clearly understanding this new dynamic, liberal Democrats and their backers convinced the powers that be in Silicon Valley to nip this new and dangerous upstart, the right-wing blogosphere, in the bud, which has by now been largely accomplished. Powdered Wig’s traffic and revenue are down 98% from its pre-Trump peak. Despite investing thousands of dollars that we paid to Facebook to help promote our pages and groups, Facebook shut them all down on October 11, 2018. We have been shadow-banned by Twitter. Our posts get little to no engagement there, as they are virtually invisible. Google has seen to it that our articles are never close to the first search page. Newsguard, like Snopes and SPLC, is nothing more than a partisan, dishonest, America-hating leftist tool that calls all pro-Trump sites “unreliable” while giving its green “reliable” check mark to the likes of CNN and MSNBC. Newsguard has advised advertisers to not advertise on pro-Trump sites in an effort to completely run us all out of business. There is one way to combat this egregious violation of the First Amendment. Share our articles everywhere you can, on every social media site you belong to, especially Facebook and Twitter. “By licensing the NewsGuard ratings, advertisers limit their advertising, including programmatic advertising, to sites that meet the NewsGuard criteria” explains the neocon extension’s official website “Advertisers use this data and related information about sites to craft efficient—and safe—ad campaigns.” Programmatic advertising is essentially the use of automation to purchase ads, as opposed to manual selection and placement of ads by humans. Adweek calls programmatic advertising “the most important trend in advertising,” and estimates that 82 percent of ads will be programmatic by 2020. NewsGuard’s stated goal of separating advertising revenue from “unreliable news websites” isn’t just talk. The project’s investors include Publicis Groupe, one of the “big four” multinational advertising agencies whose subsidiaries include a number of high-profile advertising firms including Leo Burnett Worldwide and Saaatchi & Saatchi. Controversially, one of Publicis Groupe’s other subsidiaries is Qorvis — a Washington D.C-based PR and crisis management firm which has represented the nation of Saudi Arabia since the September 11 attacks. The company led an aggressive media and lobbying campaign in the U.S. to defend Saudi Arabia’s war in Yemen. As Qorvis’ parent company funds NewsGuard, this is presumably considered responsible journalism. The beltway establishment figures who started NewsGuard claim to be non-partisan. But the logic of their system leads towards the demonetization of pro-Trump and populist conservative media, as well as the few anti-establishment sites of the left that are also on the extension’s blacklist, like the Daily Kos. It’s an approach that dovetails with the rise of financial blacklisting, in which left-wing and anti-Trump agitators pressure online funding platforms, payment processors, and credit card companies to cut off service from conservatives and anti-establishment figures. The goal is to render independent media unprofitable; blacklisting and censoring them by cutting off their income. “I guess the counter-argument to what you’re doing is, well, this is a bunch of establishment people deciding they like establishment websites,” said Kristol. It’s more than that — it’s also a bunch of establishment people deciding they don’t like anti-establishment websites, and wanting to wage financial warfare against them.